Murphy "Stay Sharp" knives are the result of more than 150 years of knife manufacturing experience. 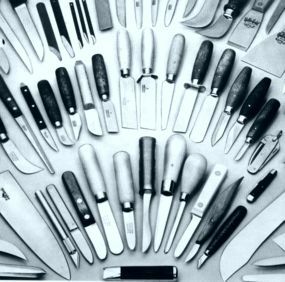 Since 1850, the company has produced cutlery for professionals in almost every field. Using only the finest steels and advanced manufacturing techniques, Murphy craftsmen produce cutting tools that provide maximum service. Most Murphy knives are available for prompt delivery from stock. If your needs cannot be met by any of these shapes and sizes, the company will be happy to quote on a special order. For further information, simply call or write R. Murphy Company and we will work with you in the development of a knife to meet your requirements.